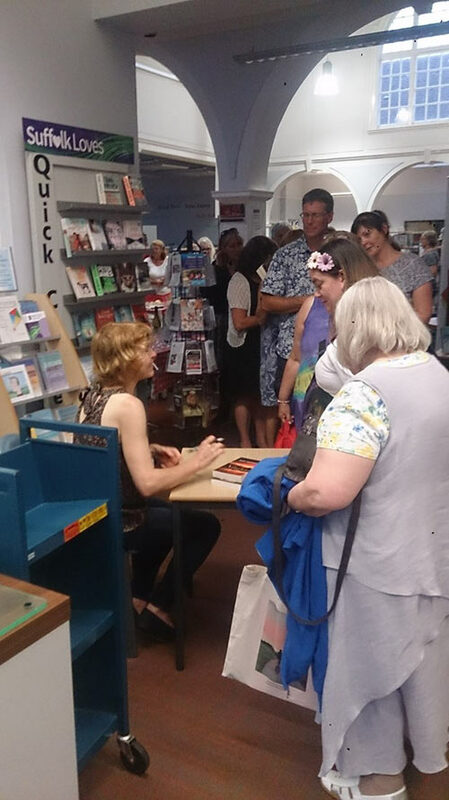 There was a lovely buzz about my book launch for Sandlands, held in Woodbridge Library on publication day, 21st July. It was great to see more than 70 people there, and to have my great friend Louise Fryer of BBC Radio 3 along to read one of the stories. Thanks very much to library staff and to the Suffolk Book League for hosting – as well as to everyone who attended. It looks as though the event was very well attended, it is good to see so many people out backing a local author. I was intrigued by ‘Suffolk Book League’ as a choice of group name and spent a few minutes checking out their site also. The beautiful cover art choice seems to have been a unanimous hit with everyone and I look forward to reading and featuring the intriguing stories behind that amber stare!